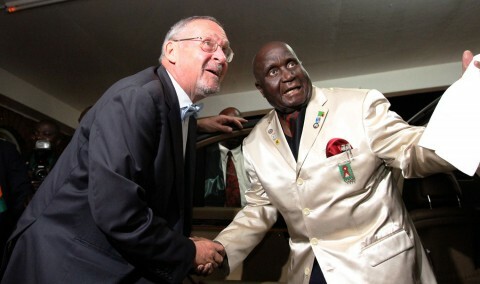 Finance Minister Alexander Chikwanda has described first Zambian President Kenneth Kaunda as an architect of Zambia’s peace and freedom. Mr. Chikwanda said Dr. Kaunda formed a strong foundation of love for humanity which has continued to unite all the 73 tribes in the country. He said because of Dr. Kaunda’s convincible steps in governing the country, Zambia is now a shining example to the rest of the world in upholding peace. Mr. Chikwanda added that because of peace, Zambia has remained one of the best investment destinations on the African continent and the world at large. ZANIS reports that Mr. Chikwanda was speaking at the Golf tournament prize giving ceremony organised in honour of Dr. Kaunda’s 90th birthday. And Dr. Kaunda has paid tribute to his late wife Betty Kaunda for inspiring him to lead the country in peace and wished he would have celebrated his historical 90th birthday with her. He further thanked Zambians for the support rendered to him and urged all Zambians to continue uniting and loving each other. And speaking on behalf of the High Commissioners and Diplomats accredited to Zambia, Zimbabwe High Commissioner to Zambia Lovemore Mazemo praised Zambians for positioning Kenneth Kaunda as the integral person for this year’s 50th independence anniversary. Mr. Mazemo said Dr. Kaunda played a critical role in the liberation struggle of independence not only in Zambia but in many countries in the African region. Earlier, KK at 90 committee Chairperson David Kombe said Dr. Kaunda’s birthday would have been incomplete without hosting a golf tournament the sports which he said he loved most. Mr. Kombe further thanked the corporate world for sponsoring the KK at 90 golf tournament which attracted a total of 160 participants.